A global study commissioned by IHG Hotels & Resorts has confirmed that lack of sleep is a primary concern for travelers, with four in five (80%) stating they have trouble sleeping when traveling away from home. Indeed, the National Sleep Foundation’s annual Sleep in America poll found that only 10% of American adults prioritize their sleep over other aspects of daily living such as fitness/nutrition, work, social life, and hobbies/personal interests. The business traveler loses around 58 minutes of sleep each night when staying away from home, averaging just 5 hours and 17 minutes of sleep. "It’s no secret that travelling can be challenging for our health, particularly when it comes to maintaining our normal sleep patterns. Light is the major environmental time cue that resets the circadian clock in our brains each day, which is easily thrown off when traveling," says Dr. Steven W. Lockley, Associate Professor of Medicine, Harvard Medical School, and advisor to the study. IHG is piloting the use of the JOURNI Mobile Task Light, developed by Healthe (also a project in which Dr. Lockley is involved). The item is a dual-spectrum luminaire that helps to regulate the body’s circadian rhythm or 24-hour internal body clock important in managing biological functions such as sleep, hormone levels, body temperature and metabolism. IHG is testing various sleep aids within its family of brands. For instance, the Crowne PlazaHotels & Resorts Sleep Advantage Program focuses on bed linens made from 100% cotton for softness. Also, the brand incorporates the "This Works" aromatherapy line of essential oils to help guests recover from the day’s stress and sleep more soundly. 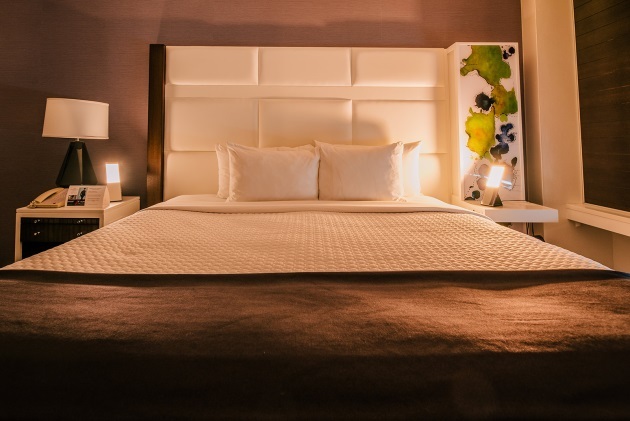 EVEN Hotels highlights the healing and stress-reducing properties of lighting as a way to offer guests a convenient way to keep up with their health and wellness routines on the road. Beyond food and exercise components, the brand offers initiatives that build on the bigger wellness picture, such as plush bedding, aromatherapy amenities, and lighting profiles that energize and relax. Holiday Inn contributes to the cause with a Pillow Menu. As not all pillows appeal to everyone, the Pillow Menu was introduced at all Holiday Inn locations in the early 2000’s and can be requested at the front desk of the hotel. The menu consists of pillows that aren’t found in the hotel rooms. Rather, they are alternatives for people who have different needs and vary from firmness, as well as type of fill. The National Sleep Foundation poll found that among U.S. adults with excellent sleep health, nearly 90% say they feel very effective at getting things done each day, compared to only 46% of those with poor sleep health. When asked to prioritize their daily health values, 35% said fitness/nutrition was key, 27% put their work on top, 17% said hobbies/personal interests were most important, 10% said sleep comes first, just ahead of the 9% who prioritized their social life. A majority of the public (65%) agreed that getting enough sleep makes them more effective, yet 41% admit to rarely taking into account how much sleep they need in planning for the next day. "This is exactly what I see in my practice every day," said Dr. Joseph Ojile, Chair of the Foundation’s Board of Directors. "People, from children to adults, are consistently overscheduled. They are not getting enough sleep because they do not block out enough time for it." A few hours of lost sleep combined with business travel significantly reduces performance. Business travelers perceived themselves as performing at a much higher level than they actually did (a 20% drop). Travelers actually performed best during midday, not early morning, which many consider to be prime time for productivity. Of those who rated their performance highly, half fell asleep unintentionally on the trip. Study participants slept, on average, only five hours the night before a trip, the lowest of the entire seven-day monitoring period. But they reported getting an hour more sleep than they actually did. "Any sleep period less than six hours a night begins to significantly diminish performance," Rosekind said. "Essentially, travelers are at a decreased productivity level before they even walk out their door." Those who exercised during their trip performed an amazing 61% better than nonexercisers. Study participants registered a total sleep loss of almost eight hours by the time they returned home, the equivalent of one full night's sleep. In general, "losing" time is more difficult to adjust to than "gaining" time. That means that travelers heading east tend to lose time and then gain it again heading west — unless, of course, they are passing the international dateline in the process. Any traveler heading to China, for instance, from Los Angeles will completely lose a day going west and gain a full day back on the L.A. return. Generally, it takes about one day to adjust for each hour of time change. While there are plenty of pointers for how to manage sleep on the road, it is never easy, especially when expected to rise and shine from a long-haul flight and face a day of meetings when sleep only came in fits and starts during the many hours of transit. However, wisdom suggests that exposure yourself to as much light at possible during the waking hours is essential followed by taking care not to be exposed to bright light when it is dark outside. Even the light from a computer screen or turning the light on in the bathroom in the middle of the night can adversely affect a road warrior’s valuable sleep.